Barbecue restaurants in Branson offer their different brand of BBQ just as they do across the country. There is a personality to barbecue that instills great rivalries between areas of the US. But most will agree that it isn't BBQ unless it is smoked slowly. Pouring BBQ sauce on meat just won't cut it with most folks. People even spell it differently. There are Barbecue restaurants, Barbeque restaurants, BBQ restaurants, Bar-B-Que restaurants and probably other unique spellings. Smoked meat artisans will argue about the best wood to use, the proper length of time for each cut of meat, the spices to rub on the meat and even whether a sauce should ever touch the meat while smoking. Frankly, we don't find too many styles that we don't like other than the meat that sits under a heat lamp for too long. That will send us packing with no plans for returning. For our money these are some of the best restaurants in Branson Missouri. We like the Barbecue sandwiches. This is one of our favorite places for lunch and has a friendly crew of people to serve you. Make your order at the counter and they'll bring the food out to you. Plenty of paper towels on the table allow you to really dig in. Located down Hwy 165 as you head toward the lake, it sits next to the Fall Creek Inn and Suites. 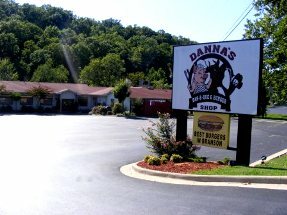 Their second location is located just south of the intersection of hwy 76 and business 13 in Branson West. Charlie's has great steaks and ribs and a good atmosphere. It is also listed on the Steak Restaurant page. They have a female singer at times that sings poplar tunes throughout the restaurant. If all your group isn't up for BBQ, Charlie's has a great menu of other items including great steaks. Charlie's is located on the strip but back from the street behind the entrance to the Hall of Fame Motel on the north side about a block or so east of the Titanic. This is a chain and has a good menu of barbecue and sides. You'll find a wonderful, relaxing atmosphere situated on the water of Lake Taneycomo. 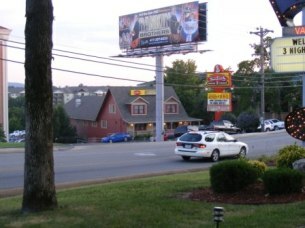 Famous Dave's is located in the Wharf District of Branson Landing. If you're going strictly to eat, you'll want to park on the north part of the landing. Besides the Barbecue, Gilley's has steaks, Chili, Tex-Mex and more. This is a regular stop for our family. This is a chain Barbecue Restaurants in the Midwest, Southwest and Florida. We like it. They have good meat and some very good side dishes. Located inside Silver Dollar City this is a favorite of many. The Rib-house has a great outdoor atmosphere next to the Lost River water ride. You may find it hard to walk past the outdoor grills of chicken and corn on the cob. OK, this is a Buffett but they apparently specialize in smoke meats including ribs, brisket and ham. Fried chicken and ham n' beans are also a specialty. 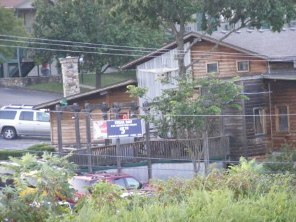 We still consider it one of Branson's barbecue restaurants with a lot of extras. Sadie's has been here for many years so they must be doing something right. Sadie's is located on the west side of the Clarion Hotel and across from the Baldknobbers on Hwy 76. These barbecue restaurants seem to be the ones that make barbecue their primary feature though many others serve barbecue as well. We think there needs to be more variety of Barbecue Restaurants in Branson and hope more options will be available soon.